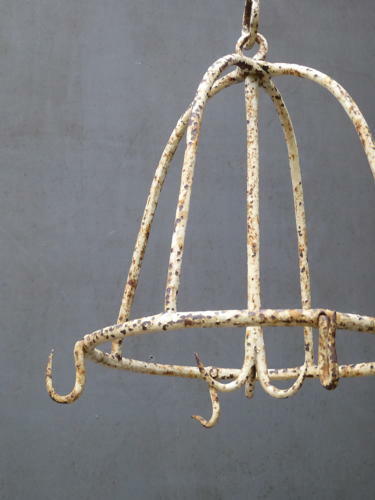 A superb set of early antique iron game / meat hanging hooks. An exceptional example & an unusual take on the traditional 'Dutch Crown' design, with a central triple hook surrounded by a collar supporting a further four single hooks. In its original painted finish with a wonderful age related patina. Wear commesurate with age, unrestored. Solid with one crack / break at the base joint one of the uprights which is barely visible, totally secure & does not detract (see close up, last image). UK courier service available at £12 tracked & signed for 24 hour delivery.